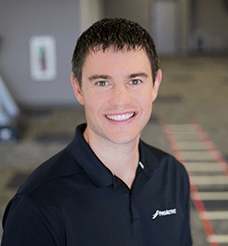 Henry returned to his hometown to join the ProActive Physical Therapy team after starting his career in Mankato, MN. He graduated from the University of Iowa Carver College of Medicine where he received his Doctorate in Physical Therapy. Prior to graduate school, he received his Bachelor of Arts degree in Health and Human Performance from Dordt College. Through his own injuries in high school and collegiate sports, Henry fostered a love for treating impairments of the human body. He experienced first-hand the expertise that physical therapists have in providing conservative evidence-based treatments and knew that he wanted to make a difference in people’s lives as a physical therapist. More than anything, Henry enjoys the opportunity to make a lasting impact in patients’ lives. He is dedicated to ensuring that all patients feel confident in the plan of care necessary to help them achieve optimal function and health. Outside of the clinic, Henry stays busy raising two boys with his wife, Kendra. He enjoys staying active with family and friends through playing a variety of sports, card games, and board games. He also joyfully pursues personal fitness goals through running and weight lifting. The opportunity to make a lasting impact in patients’ lives makes me excited to go to work each and every day. Working toward restoration of joint motion, strength, or movement patterns are just a few components that can improve both function and overall quality of life. Meeting the goals of patients is always thrilling whether it is walking again, playing on the floor with young family members, competing in an upcoming race, or getting back to a favorite recreational activity. The challenge of understanding the many factors that can contribute to a problem combined with successful implementation of targeted treatment interventions is always exhilarating. Q: What led to your decision to work at ProActive Physical Therapy? I chose to work at ProActive because of the opportunity to serve my hometown community. The dedication to providing personalized, optimal care to all of their patients and emphasis on empowering patients to achieving optimal function and health were three keys in making the decision to work at ProActive. I would like every patient that leaves ProActive Physical Therapy to be confident that they were understood, treated with respect and dignity, and received the highest quality care that conservative physical rehabilitation offers.